A rare type of meteorite that could hold clues to the birth of our Solar System has been bought by London's Natural History Museum. The chemistry in the Ivuna meteorite is thought to contain information about the conditions that gave rise to the Sun and planets 4.5 billion years ago. It landed in Tanzania in 1938 as one 705g stone, since split into samples. Pieces from the UK sample, the largest in any public collection in the world, will be removed for study. Most Ivuna samples are held in private collections, or by the Tanzanian government. Ivuna is extremely rare - just nine of the 35,000 known meteorites, or 0.03%, share similar chemistry. It is a so-called carbonaceous chondrite. It contains dust granules that may have been part of the cloud of material that came together to form our Solar System. Unlike most rock found in our stellar neighbourhood, it has not been altered by major heating sometime in its history and, as such, gives researchers a remarkable view on the past. Dr Caroline Smith, meteorite curator at the Natural History Museum (NHM), told BBC News: "These types of meteorite are very susceptible to alteration on Earth. Changes in humidity, for example, can change their composition. "But this meteorite is important as it fell relatively recently and has been kept under nitrogen in a sealed environment for the last two or three decades. "It's a particularly important specimen to science because it's been so well preserved. We're all incredibly excited about it because it's so pristine." Monica Grady, professor of planetary sciences at the Open University in Milton Keynes, commented: "This is fantastic for the UK's meteorite experts. This material represents the crumbs from the foundation of the Solar System. It's an unbelievable opportunity to study it in close-up. "The museum has been very bold in acquiring it." One question that Ivuna could help answer is how the chemical building blocks for life came to Earth. Important components of so-called pre-genetic material, the amino acids b-alanine and glycine, were found in Ivuna in a 2001 study. Last week, scientists at Imperial College London confirmed that a meteorite called Murchison contained extra-terrestrial molecules that were the precursors to DNA and RNA. 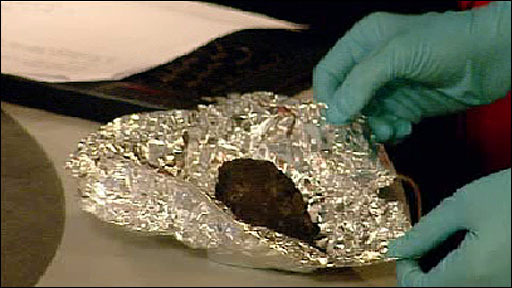 In addition to being used for research, Ivuna will be a star specimen in a new meteorites gallery, which the NHM is planning for the near future. "The plan is to take the meteorite to Nasa's Johnson Space Center in Houston, where we'll have a 20g piece taken off and that will be sub-divided into two 10g pieces," Dr Smith explained. "One piece will be put to one side. The other will be divided into 200mg allocations - less than the size of your fingernail - for researchers to study."